The aged care sector is growing in Australia and worldwide as our lifespans increase and our needs become more complex. Within the industry, there is demand for workers in a variety of roles within residential facilities, in private homes and running day activities. During CIT’s Certificate III in Individual Support (Ageing), you will develop the skills and knowledge to work in both residential aged care and community-based facilities in jobs such as support worker, day activity worker, client services officer and individual care worker. This is augmented with 120 hours of work placement. This is organised by CIT. 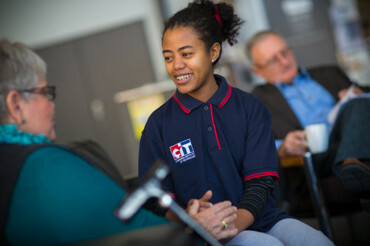 A CIT teacher supports students during work placements. The Certificate IV qualification is designed for people who have already completed the Certificate III or are currently employed in the community sector. The Certificate IV in Ageing Support places an emphasis on developing the skills and knowledge required to provide and coordinate home and community support up to a team leader or coordinator level. There are 120 hours of work placement in each program. This is organised by CIT and is delivered as three separate weeks within the semester. 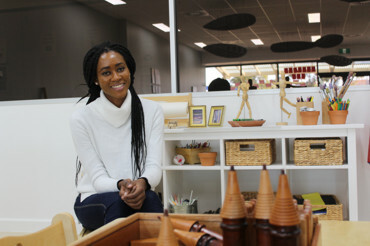 A CIT teacher supports students during work placements. Students also require an expressed interest in working with older people in a residential setting. Applicants may be interviewed to demonstrate interest in complex client support, policies and procedures of residential aged care and supervision of other workers or a small team. Description: This unit describes the skills and knowledge required to organise, provide and monitor support services within the limits established by an individualised plan. The individualised plan refers to the support or service provision plan developed for the individual accessing the service and may have many different names in different organisations. This unit applies to workers who provide support under direct or indirect supervision in any community services or health context. Description: This unit describes the skills and knowledge required to provide individualised services in ways that support independence, as well as, physical and emotional wellbeing. This unit applies to workers in a range of community services contexts who provide frontline support services within the context of an established individualised plan. Description: This unit describes the skills and knowledge required to work with basic information about the human body and to recognise and promote ways to maintain healthy functioning of the body. This unit applies to any worker who needs to use and interpret information that includes references to client anatomy and physiology. Description: This unit describes the skills and knowledge required to prepare for and provide medication assistance, and complete medication documentation. It also involves supporting a client to self-administer medication. This unit applies to community services and health workers with authority in their state or territory to assist with the administration of medication. Description: This unit describes the skills and knowledge required to care for people with life-threatening or life-limiting illness and/or normal ageing process within a palliative approach. This unit applies to workers in a residential or community context. Work performed requires some discretion and judgement and is carried out under regular direct or indirect supervision. Description: This unit describes the skills and knowledge to provide services to an older person. It involves following and contributing to an established individual plan. This unit applies to workers in a residential or community context, or those in personal care or support services that work with older people. Work performed requires some discretion and judgement and is carried out under regular direct or indirect supervision. Description: This unit describes the skills and knowledge required to work in partnership with older people and their carers to implement interventions in the context of an individualised plan to reduce risk. This unit applies to support workers in a residential or community context. Work performed requires a range of well developed skills where some discretion and judgement is required. Workers will take responsibility for their own outputs under direct or indirect supervision. Description: This unit describes the skills and knowledge required to coordinate and monitor the delivery of home based support services. This unit applies to workers in a community services context. Work performed requires a range of well developed, person-centred skills where some discretion and judgement is required and workers will take responsibility for their own outputs. Description: This unit describes the skills and knowledge required to work in partnership with older people and their carer/s to implement strategies to minimise the risk of falls. This unit applies to support workers in a residential or community context. Work performed requires some discretion and judgement and may be carried out under regular direct or indirect supervision. Description: This unit describes the skills and knowledge required to lead teams and individuals by modelling high standards of conduct to reflect the organisation's standards and values. It applies to individuals who are making the transition from being a team member to taking responsibility for the work and performance of others and providing the first level of leadership within the organisation. These managers have a strong influence on the work culture, values and ethics of the teams they supervise. Certificate III: support worker, personal carer, care worker, carer, respite worker and client services officer. Certificate IV: coordinator, team leader, support worker, service coordinator, day activity officer. Simulated Work Environment (SLE) where students will practice skills and perform assessments prior to industry placements, for example, personal care, manual handling. Students must complete class work, assignments, practical components and project work throughout a course. They may then be assessed using a combination of these tasks. Assessment outcomes may be based on demonstrating competence in various practical skills, successfully completing theory based quizzes and assignments and projects, or a combination of all four assessment methods.